The act of making something damp. A common malapropism for "damping"
Causing vibrations to stop, usually by the use of friction. In suspension systems, this is commonly done either by direct rubbing friction, or by pistons forcing fluids through small openings. Clipless pedals that require a manual release before the rider can disengage the shoes from the pedals. This term refers mainly to the Cinelli M71 pedal system, the first clipless binding system. The aluminum fork used on Lambert and Viscount bicycles in the 1970's. Don't ride on one of these! Slang term for Extension levers. A bell-crank-like device formerly marketed by Simplex as an accessory to bar-end shifters. It attached to the seat tube just above the bottom bracket. It served the function of a cable guide, but had two separate cables attached to it. The cables attached to a pivoting part at different radii, so the mechanical advantage was altered by this unit. This made it possible to shift reasonably well with the bar-end shifters, even though there was a stone-age Simplex derailer at the other end. The cable from the shifter connects to point "1", acting on radius "A". The cable to the derailer connects to point "2" acting on radius "B". The cable travel at the upper section is increased by the ratio A/B. 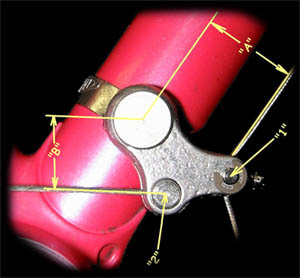 Cable tension on the segment between the shifter and the demultiplier is reduced by the ratio B/A. The Jtek ShiftMate is a similar device, used to match indexing when shift controls are mismatched with a different derailer. Since the popularization of direct-pull cantilevers, such as Shimano's V-Brake, several companies have introduced new versions of the demultiplier, for example the Quality Bicycle Products Travel Agent ®, to permit conventional levers to work with these brakes. Early '80s "ærodynamic brake calipers from Campagnolo. These used a four-bar linkage which resulted in a change in mechanical advantage as the brake shoes wore. See Jobst Brandt's analysis of this design. There are two entirely separate bicycle industries. Bicycles intended for real use are sold primarily in bicycle shops, and also, to some extent, in sporting-goods stores. Bicycles sold through this side of the industry are well made and sturdy, and are sold fully assembled, tested and guaranteed. A mechanism for moving the chain from one sprocket to another to change gears on a multi-speed bicycle. A typical derailer consists of a parallelogram which moves a cage. In the case of a rear derailer, the cage has two chain pulleys, a jockey pulley and a tension pulley. Different derailers have different capacities to handle different gear ranges. Also commonly spelled in the French style "Derailleur." An extensive article on Derailer Adjustment is available on this site. Britain's Cyclists' Touring Club Website has a good article on derailer gearing. A click stop, a place where a mechanism is designed to fall into one or another specific settings. This usually consists of one of several valleys in a track, along which a spring-loaded part slides. When the spring-loaded part is released, it tends to fall into one of the valleys. This is commonly used in bicycles in indexed shifting systems. Development (also known as rollout), is one of the three comprehensive systems for numbering the gear values for bicycle gears. Development is the distance the bicycle travels for one crank revolution, and is usually measured in meters. Development can be calculated by dividing the chainwheel size by the rear sprocket size, multiplying the result by the wheel diameter and by pi (3.1416). See also gear inches and gain ratios. Down Hill, specifically, down hill racing. This activity goes against the spirit of cycling more than any other branch of the sport, since it is the only branch of cycling which is not powered by the riders' muscles. This sport should, perhaps, be considered a branch of motorcycling, not cycling. The leading Japanese brake supplier before Shimano acquired a near monopoly on the Japanese parts business. Dia Compe used to have a working relationship with Sun Tour, and made the brakes labeled "Sun Tour." Dia Compe components have a well-deserved reputation for quality. Dia Compe first made a major impression on the bicycle industry in the late '60's, by inventing extension levers for drop-bar brakes. At that time, Weinmann was the leading brake manufacturer. Dia Compe's extension levers were so popular that Weinmann entered into a licensing agreement with Dia Compe, allowing Dia Compe to copy Weinmann's brakes in return for letting Weinmann copy Dia Compe's extensions. More recently, Dia Compe has revolutionized the design of headsets, with its "AheadSet" threadless headsets. This is the standard design for a bicycle frame, and has been for over a hundred years, since it supplanted the cross frame. It is one of the most nearly perfect pieces of design known, due to the extreme amount of refinement it has undergone over the last century, and its purity of form. It is unlikely that the diamond frame will ever be surpassed as a way to build a rigid-frame bicycle using joined tubes as a construction medium. This is not to say that the diamond frame is the end-all and be-all of bicycle design. Monocoque construction with suitable materials has real merit, and the design of bicycles with rear suspension is at a stage where many different designs appear viable. 1" x 24 tpi Steering columns British, Italian, I.S.O. The corresponding bolt-like tool for cutting female threads is called a tap. A cantilever brake in which the housing stop is on one arm, and the inner cable crosses straight across to an anchor bolt on the other arm. The best-known direct-pull brakes are made by Shimano, using their trademark "V-brake." This type of cantilever does not use a separate transverse cable. It has two tall arms, one of which has a housing stop and the other the anchor bolt. The exposed part of the cable runs horizontally from one arm to the other. Direct-pull cantilevers have more mechanical advantage than other brakes, so they require special hand levers with less-than-average mechanical advantage to keep the overall mechanical advantage in a useful range. See my article on Direct-Pull Cantilevers. A bicycle wheel should have the rim centered directly in line with the frame. The forkends are symmetrical with respect to the frame, and the hub axle locknuts (or equivalent surfaces) press against the insides of the dropouts. Wheels should be built so that the rim is centered exactly between the axle ends on the hub. In rear wheels, the spokes attach to flanges which are not symmetrical about the centerline...the right flange is usually closer to the centerline than the left flange, to make room for the sprocket(s). When rear wheels are built properly, the spokes on the right side are made tighter than those on the left side, pulling the rim to the right, so that it is centered with respect to the axle (and to the frame.) 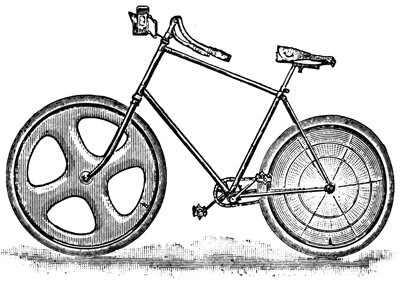 Viewed edgewise, a rear wheel built this way resembles a dish, or bowl, since the left spokes form a broad cone, while the right spokes are more nearly flat. By extension, the term "dish" is used as a general synonym for accurate centering, even in the case of symmetrical wheels. See also my Wheelbuilding article. A tool for checking the dish of a wheel. It has the form of a curved stick with an adjustable feeler near the middle. The two ends of the stick rest on the side of the rim, 180 degrees apart, and the feeler is adjusted to just touch the locknut or other locating surface at the axle end. The wheel is then inverted, and, if it is correctly "dished" the three points will all contact the corresponding points on the second side of the wheel. A hub brake, similar to an automotive disc brake, consisting of a disc which bolts or threads onto the hub and a caliper attached to the frame or fork which squeezes on the disc. Disc brakes are better able to dissipate heat than rim brakes, making them popular for downhill events and for tandems. Some early disc brakes had a reliability problem, in that outer part of the disc could break away from the part that attached to the hub, causing complete failure with no warning whatever. When the rider would squeeze the brake lever, it would feel solid, as the caliper was gripping the disc securely...unfortunately, it would do nothing to stop the bicycle! Disc brakes are becoming increasingly common, partly because they work in wet conditions when rim brakes don't, partly because they don't cause wear to rims, and partly because of fashion. See our article about disc brakes. There have been concerns about the safety of front disc brakes in conjunction with quick-release skewers. See James Annan's article on this topic. A disc wheel is a wheel with solid sides, instead of spokes. Although disc wheels are heavier than spoked wheels, they have less air resistance, and permit a cyclist to go noticeably faster. They are not usually used at the front, because they can cause severe handling problems in crosswinds. They are not usually used for hilly conditions, because the added weight is too much of a disadvantage on the climbs. The illustration is from Archibald Sharp's Bicycles and Tricycles , originally published in 1896, republished by the M.I.T. Press in 1977. The front wheel has cutouts to reduce steering problems that result from crosswinds when disc wheels are used on the front. Providing a draft when a leader needs help keeping/catching up. Carrying extra water bottles and food for the leaders. Blocking opposing riders from passing. Giving up a bike to a leader who has had a crash or other mechanical difficulty. A "donkey-back" is a setup for a multi-rider tandem, where the rearmost stoker's crankset is concentric with the rear hub. This stoker's saddle is mounted on an extension that resembles a pannier rack. It requires a very special rear hub with an axle within an axle. There is a sync chain running from the donkey back's cranks forward to the penultimate stoker's crankset. Donkey backs were used primarily around the turn of the century as pacing vehicles (usually quads) for track races (a task later taken over by special motorcycles, such as the Derny). The donkey-back design placed the rear stoker back over the wheel, to give the racer on the solo the best possible draft. Some donkey-backs have been sold as utility tandems. A crankset having two chainwheels. A double century; 200 miles. Butted at both ends. This term is commonly used to refer to frame tubes and spokes, although some prefer the term "swaged" when discussing spokes. 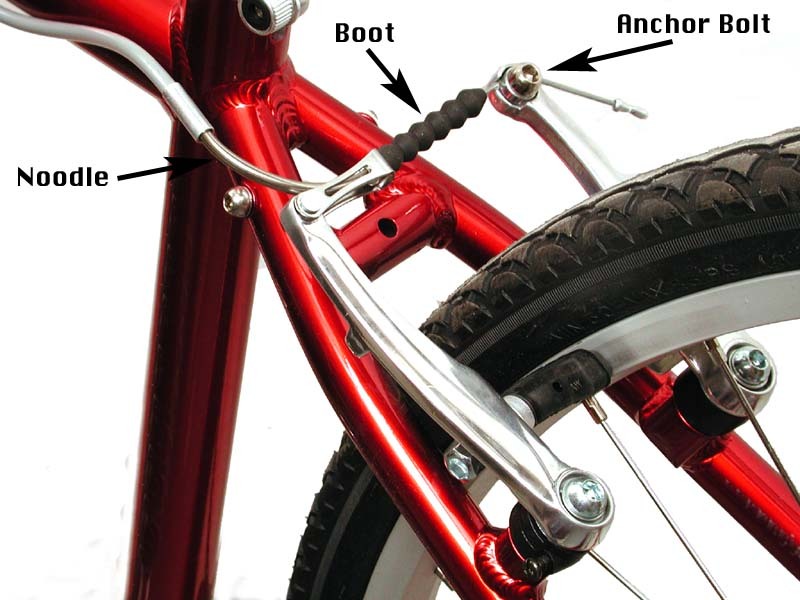 Many newer drop handlebars have an indented groove or grooves in the curved section above the brake levers. Single-groove handlebars have such a groove along the front edge only, to accommodate the brake cable running from a modern "æro" brake lever. 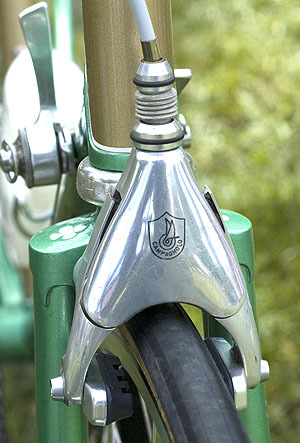 Double-groove handlebars have, in addition, a groove on the rear edge of the bar, to accommodate the shift cables from Campagnolo (or Sachs) Ergo shifters. If a double-groove handlebar is used without Ergo shifters, it is a good idea to tape a short length of housing into the groove, or to use a special rubber filler piece made for the purpose. The act of shifting both the front and rear derailer at the same time. This is fundamental to the use of half-step or alpine gearing, unnecessary with crossover gearing. A hub which can be fitted with a sprocket on each side, so that a one-speed bicycle can have two different gears, which are selected by removing the wheel and turning it around so that the other sprocket may be used. Also known as a "flip-flop" hub. The most common application for double-sided hubs is for fixed-gear bicycles. Many fixed-gear fans have a fixed sprocket on one side, and a freewheel on the other, using one or the other as conditions change. This is discussed at more length in my article on Fixed Gear Road Bicycles. The frame tube that runs diagonally up from the front of the bottom bracket up to the lower end of the head tube. 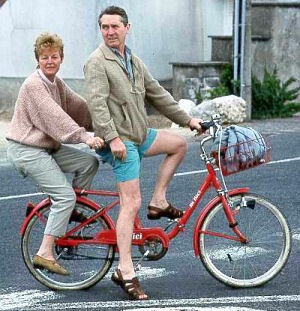 I consider this fad to be bad for cycling, and contrary to the spirit of cycling. It is effectively just a variant form of motorcycle racing, since most of the power is provided by the machinery that carries the rider and bike to the top of the run. Bicycling should be a human-powered activity, or it is not bicycling to me. The act of shifting to a lower gear. In the case of derailer gearing, this means shifting to a larger rear sprocket, or a smaller chainwheel in front.